Valegro’s moves really impressed a Kiwi eventing journo. I’ve never been one to be particularly interested in dressage, but having the opportunity to watch Charlotte Dujardin today was something I won’t forget in a hurry. Valegro is gorgeous and wow, can he move! 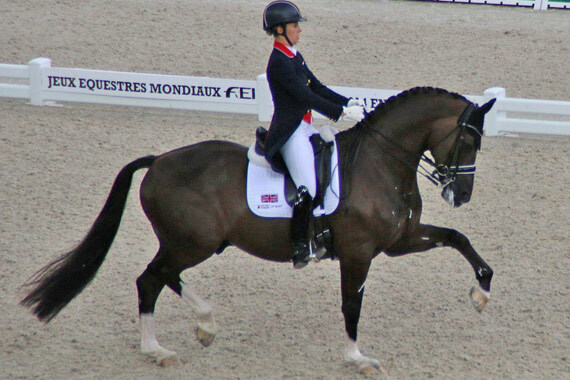 Charlotte Dujardin was as entertaining and charming as her horse, Valegro. I watched a number of tests, including Adeline Cornelissen (another great test). One of my favourite “jobs” as being part of the accredited media is to go to the mixed zone and see the riders up close, and hear what they have to say after their performances. The mixed zone at Stade d’Ornano is under the grandstand nearby where the entrance / exit is. It is the most cramped mixed zone I have worked in, but we get the impression that some changes may be made as the FEI Communications staff came down and were studying the area hard, having lots of discussions and pointing. It currently is a real bun fight when the big stars are there, with TV cameras, photographers and journalists all hustling for positions. I was particularly impressed with a Dutch photographer, he was about 6 foot 5 tall and then he held his camera up as high as he could to take some “bird’s eye” shots! Luckily he stood near the back most of the time otherwise I wouldn’t have stood a chance. You get a bit of an idea of the riders’ personalities during these sessions. Edward Gal is quite the personality. He was quite keen to find out from some of the journalists he knew whether they had found a good sushi bar in Caen! Adeline is so very graceful, and so very charming. What a star she is, so tolerant, always smiling, good answers even when she had to answer the same question many times – first for FEI TV followed by the other three or four television cameras, then the Dutch press, then in English for the rest of us! What a superstar! Adeline Cornelissen. Charlotte too was quite the entertainer and very humble, and again had to repeat her answers many times. I managed to catch a minute with her at the very end, and she was more than happy to talk to an eventing journalist, especially when it comes to talking about our Sir Mark Todd. Her eyes lit up and she said was more than happy to talk about him. Thanks Charlotte, you made my day! An update on the car pass, Vicki managed to not only get the car pass she needed, she also got a VIP ticket for the day to watch the dressage and three lovely hats. How she managed this, we are mystified and she is not letting us in on her secrets. We are now expecting her to sort out tomorrow’s proceedings. The media course walk of the cross country is on at 2.30. That’s great. EXCEPT the trot up starts at 3pm. So, I’m heading out to Haras du Pin tomorrow, and will attend the trot up. I will walk as much of the course as I can, hopefully they will see sense. Otherwise I’ll be doing it in stages over the next few days, if possible. Watch this space! Edward Gal and Glock’s Voice enter the arena. We now know that Edward had sushi on his mind. From the forbidden zone: The “Ring Marshall”, Lord of the entrance. Rivera de Hus and Jessica Michel (France). Dutch supporters keep a close eye on Adelinde and Parzival. French rider Jessica Michel reacts to the crowd’s applause after her test on Rivera de Hus.